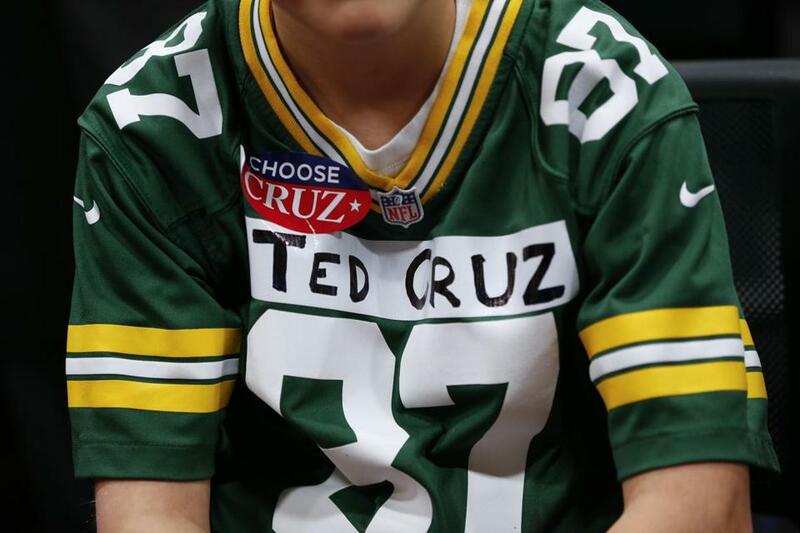 Noah Ryan, 13, showed his support for the Packers and Ted Cruz during a campaign event Sunday in Green Bay, Wis.
WASHINGTON — They’ve duked it out in debates, over Twitter, and in hard-fought primary elections attracting millions of voters. But now as the remaining three Republicans running for president prepare for a possible contested nominating convention in July, a shadow campaign has begun for the hearts and minds of delegates who will fill the Cleveland convention hall. The stakes in this stealthy combat could wind up to be at least as important in determining the party’s nominee as the actual primary elections. Here’s how it works: If front-runner Donald Trump fails to secure the 1,237 delegates necessary to clinch the nomination before the July 18 convention, nearly all of those state delegates who were obligated to vote for Trump under their home-state primary rules will be released, after an initial ballot, to support whomever they want. Senator Ted Cruz, in that scenario, is hoping to pounce. Even as he has been campaigning to win the Wisconsin primary on Tuesday in an attempt to blunt Trump’s momentum, the Texas conservative and his supporters have been waging state-by-state battles to influence state conventions that choose the Cleveland delegates. Donald Trump’s final rally on the eve of Wisconsin’s Tuesday primary attracted a smaller than usual crowd. The goal is to organize aggressively at state conventions and stack each state’s Cleveland delegate roster with Cruz loyalists. On a second ballot at the Cleveland convention, they would be ready to vote for Cruz. That’s the theory, anyway. Party officials could float some other name on the eve of the convention — Ohio Governor John Kasich, for instance, who is still in the race; or House Speaker Paul Ryan — and potentially blow up Cruz’s strategy. But for now, Cruz’s campaign is the most organized operation at the state level. And planning for this grind-it-out, rules-heavy strategy has been underway for months. For average voters keeping track at home, this adds new layers of mind-numbing complexity to the GOP’s primary contest. 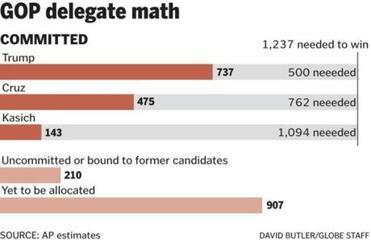 Trump has 737 delegates, and would need to capture 500 of the remaining 907 unallocated delegates to become the nominee. If he falls short, the Republican National Committee is preparing to do its best to assure the public that it will have an “open and transparent’’ process to pick a contender for the Oval Office. The RNC unveiled a new website last week detailing how the rules would work. Most delegates are bound on the first ballot to vote according to their state’s primary results. If Trump fails to win support of 1,237 delegates on that first vote, the delegates become freed in subsequent rounds to vote for their personal preference. It’s a whole different game than the one Trump has mastered, drawing thousands to his rallies and turning out scores of first-time voters at the polling booth. Trump, desperately trying to gain ground, last week hired veteran political consultant Paul Manafort as his convention delegate wrangler and opened a new Washington office to coordinate his campaign’s convention and delegate operations. Trump has argued that the rules are not fair, even threatening a lawsuit in Louisiana, where he won the primary but Cruz may emerge with more delegates. He also has warned of riots at the GOP convention in Cleveland if his supporters perceive that the nomination was stolen from him. Trump’s campaign did not respond to requests for an interview. The Cruz campaign, whose ground troops in individual states are better organized than Trump’s, claims to be better prepared for a contested convention. Hill, Cruz’s Virginia co-chairman, said the campaign recognized last November — well before votes had been cast — that Cruz’s path could hinge on a contested convention. The campaign began plotting, in weekly conference calls with volunteers, how to strategize, he said. Virginia provides an instructive example. Cruz, coming in third, emerged from the March 1 primary with only eight of the state’s 49 delegates. The campaign now predicts 60 to 70 percent of Virginia’s delegates will pick Cruz on a second ballot, Hill said. How did it arrange this feat? By paying attention to details as mundane as registration deadlines for congressional district and statewide conventions, where the delegate selections occur, and making sure Cruz supporters met them. It then recruited delegates who have signed loyalty pledges to Cruz. The first of the 11 conventions at the congressional district level will take place on Saturday. “We are going to flood the 11 congressional conventions across the state,” Hill said. Thirty-three delegates will be selected from the congressional district level. In addition, there are 13 at-large delegates selected by a nominating committee at the statewide convention later this month, plus three party leaders. The Cruz campaign hopes to replicate their delegate strategy in Massachusetts, where Cruz came in fourth, winning just four of the state’s 42 delegates. 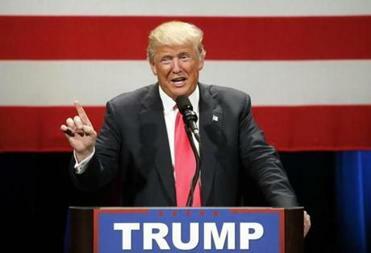 Trump, who won 49.2 percent of the vote in Massachusetts, earned 22 delegates. Whereas Trump won Massachusetts thanks to the backing of independent voters, only registered Republicans can vote for or run to be a state delegate to the national convention — giving Cruz an edge, said state representative Jim Lyons of Andover, Cruz’s Massachusetts chairman. Trump is also being outhustled in North Dakota, which did not hold a primary or caucus like most states and instead selected delegates over the weekend in a statewide convention. All 28 of them are unbound, meaning they are not required to support any one candidate and can change their minds anytime. “Our criteria favors people who have long participation in the party and virtually no opportunity for people who have no participation to be considered,” said Curly Haugland, a Republican National Committeeman from North Dakota. Cruz spent several weeks planning for the North Dakota convention, taking a break from campaigning in Wisconsin to speak in Fargo on Saturday and offering up a slate of his own delegates from the convention floor. Trump was much less active, sending his former Republican rival Ben Carson as his surrogate in North Dakota. Several state party activists did not know of anyone working on the ground for Trump. The result: Cruz claims to have secured 18 of the state’s 25 available delegate slots. Tracy Jan can be reached at tracy.jan@globe.com. Follow her on Twitter @TracyJan. Matt Viser can be reached at matt.viser@globe.com. Follow him on Twitter @mviser.